The Washington High School tennis team is pictured at Unioto High School at their season-opening match Monday, Aug. 13, 2018. (l-r); Brooklyn Foose, Bethany Wilt, Caroline Frederick, Sydnie Hall, Brynne Frederick, Jen Richards, Megan Downing, head coach Samantha Leach, Payton Maddux, Sierra Rodriguez and Mei Kobayashi. 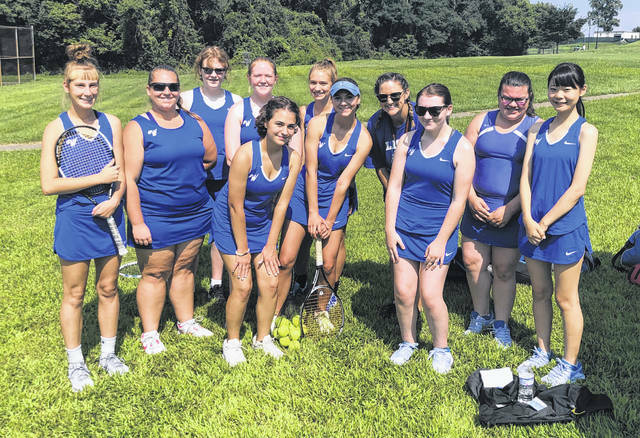 CHILLICOTHE — The Washington Lady Blue Lion tennis team opened the 2018 season with a non-conference match at Unioto Monday, Aug. 13. Washington won the match, three courts to two. At first singles, Unioto state-qualifier Sylvia Gray defeated Megan Downing, 6-0, 6-0. At second singles, Unioto’s Macy Bridenbaugh beat Washington’s Jen Richards, 6-4, 7-6 (10-8). Washington won the next three courts to earn the overall match win. At third singles, Brooklyn Foose defeated Sarah Spires, 6-1, 6-0. At first doubles, Bethany Wilt and Sydnie Hall beat Neysea Edwards and Candice Theil, 6-4, 6-2. Brynne Frederick and Payton Maddux defeated Eden Griesheimer and Emily Hanna at second doubles, 6-1, 6-2. Washington hosted Jackson Tuesday in the first Frontier Athletic Conference match of the year. The Lady Lions will host Circleville Thursday at 4 p.m. at Gardner Park.